If you happened to be on Folly Beach on December 13th, you may have seen a giant blue octopus wearing a red Santa hat and riding on top of a boat. New species? Mutant genes you ask? 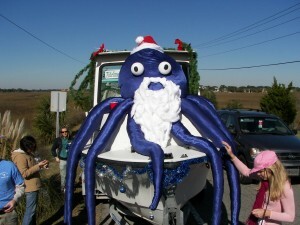 Turns out it was part of a float entered by GML in the Folly Beach Christmas Parade. Graduate students dressed as sea critters danced around the boat as it was pulled along the parade route and threw candy canes to the delight of the many children. OCTOCLAUS was a huge success, finishing in 2nd place and winning a prestigious trophy and $200 for the Marine Biology GSA. Click here for more photos and video clips.